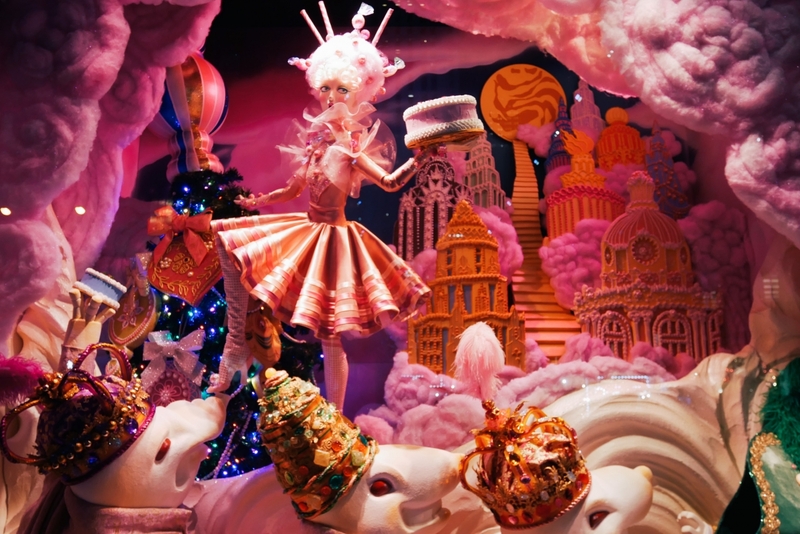 New York’s department stores are known for their elaborate holiday windows. 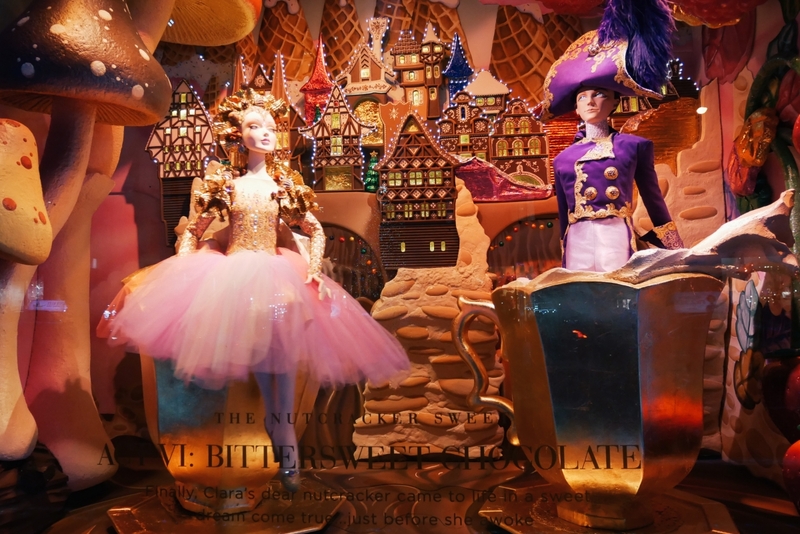 These aren’t your typical windows with products and styled mannequins. 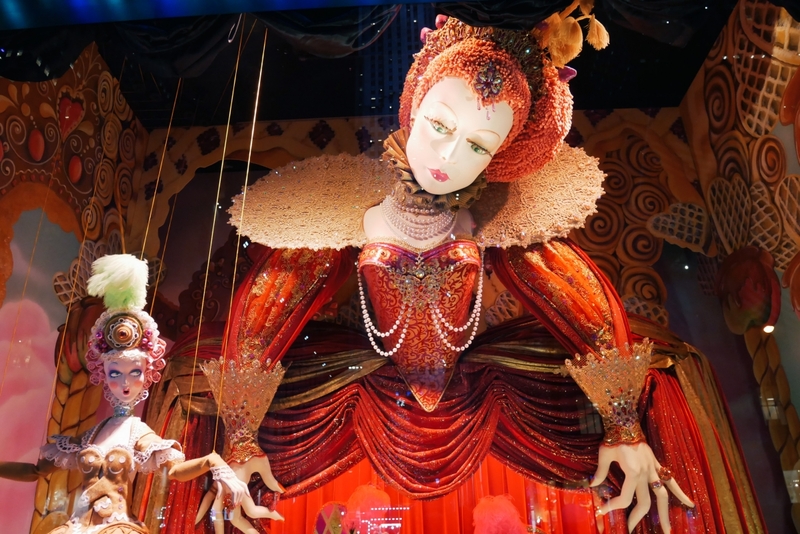 They’re extravagantly designed displays that the stores work on for months before they’re unveiled. Each store usually chooses a theme for the year. 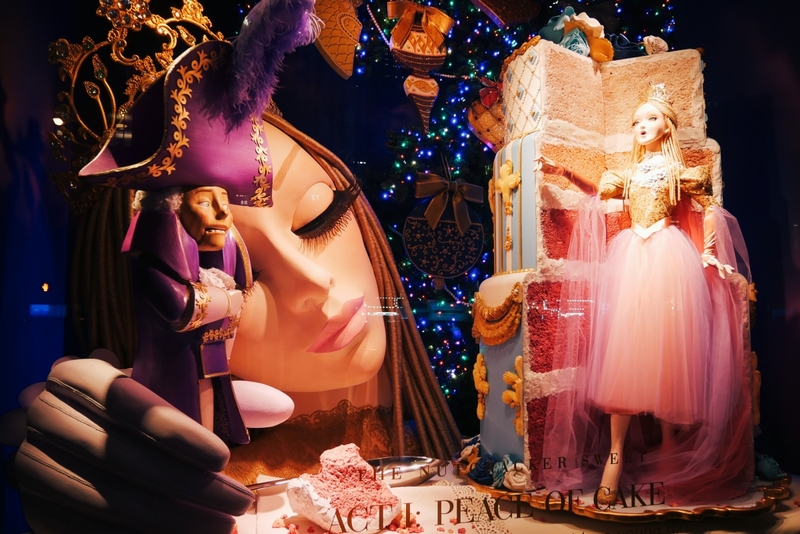 The 2017 windows’ themes included Snow White, family traditions, snow globes, New York, and Earth through the ages. 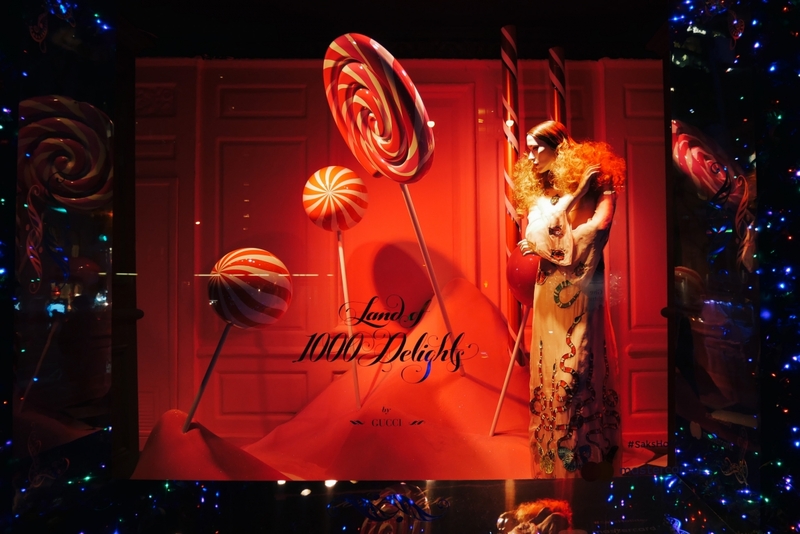 When I visited New York in December, Saks Fifth Avenue’s window displays—called Land of 1000 Delights—had a colorful candy theme. 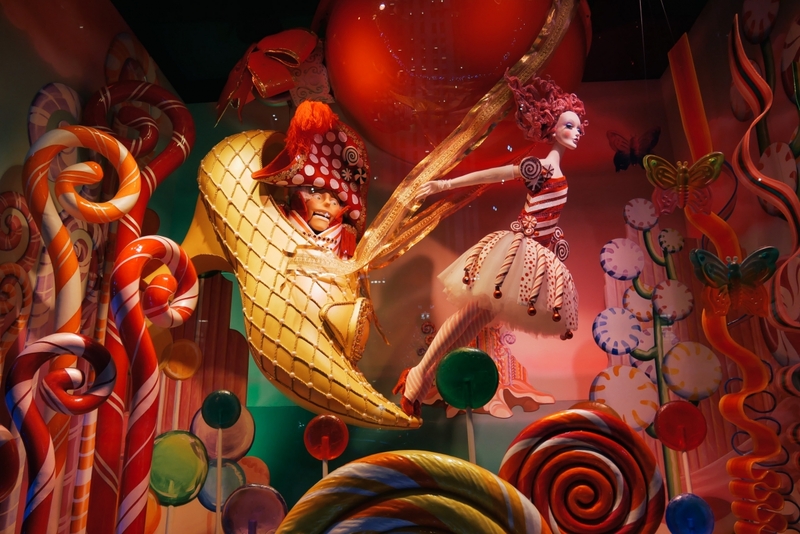 It was an enchanting whimsical display featuring large lollipops, cotton candy, rock candy, and a variety of fantasy and fairy tale characters that moved mechanically. In practical matters: While you could catch a glimpse of the windows just walking down the street, your view was mostly blocked by people in line looking at them. The windows were fenced off, and you could enter the (short and fast-moving) queue to enjoy them. 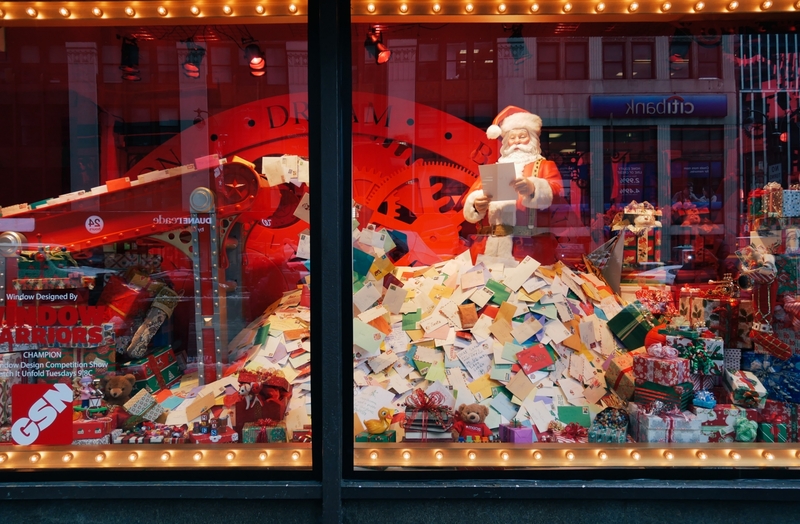 Saks Fifth Avenue plays a holiday light show on its building facade every 10 to 15 minutes. It’s best seen from Rockefeller Center across the street. 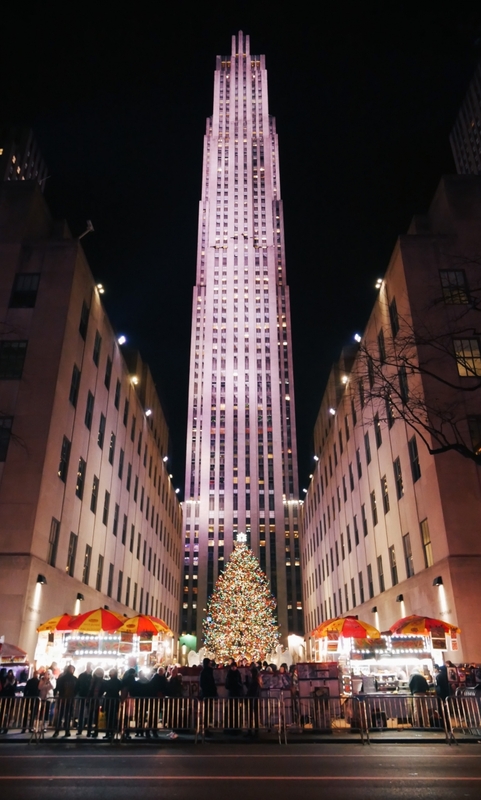 They put up this iconic Christmas tree and hold a public lighting ceremony in November or December every year. 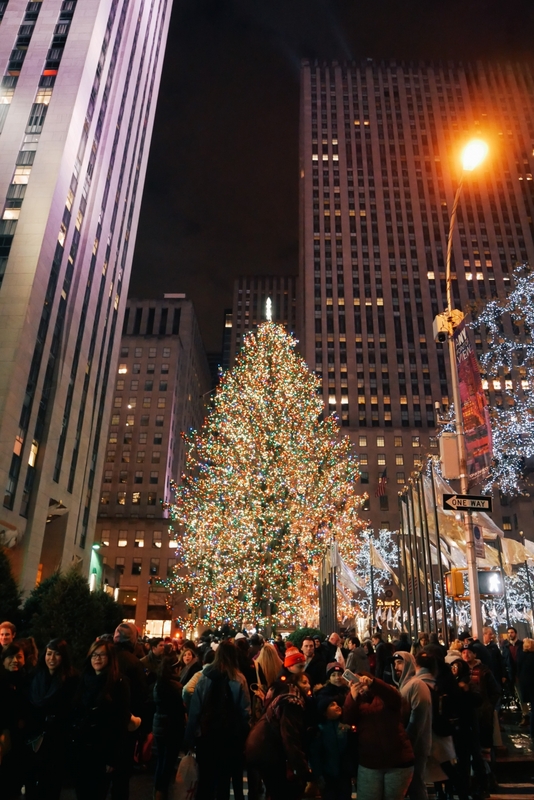 The tree is usually a 69- to 100-ft tall Norway spruce; last year’s was 76 feet tall and was lit by 45,000 LED bulbs. 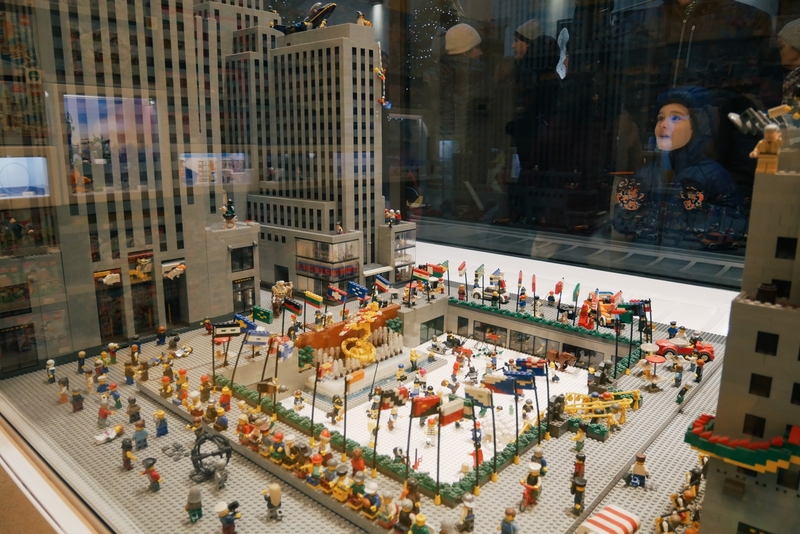 While you’re at Rockefeller, you may want to check out the Lego store and their elaborate Lego constructions. These markets are open all week long for multiple weeks. 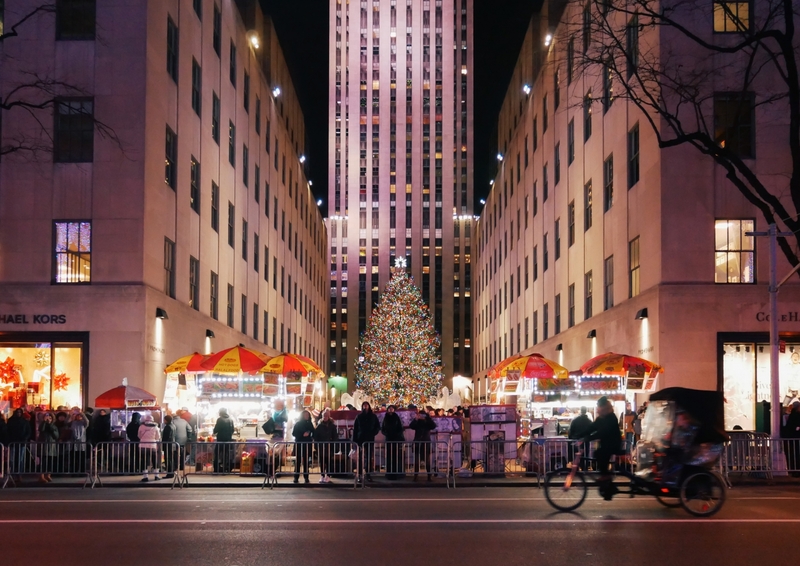 Bryant Park Winter Village — A European-style outdoor Christmas market with 125+ stalls selling decor, jewelry, clothing, and gifts. There’s food and drinks like waffles and hot cider. The 17,000-square-foot ice skating rink is a big draw. 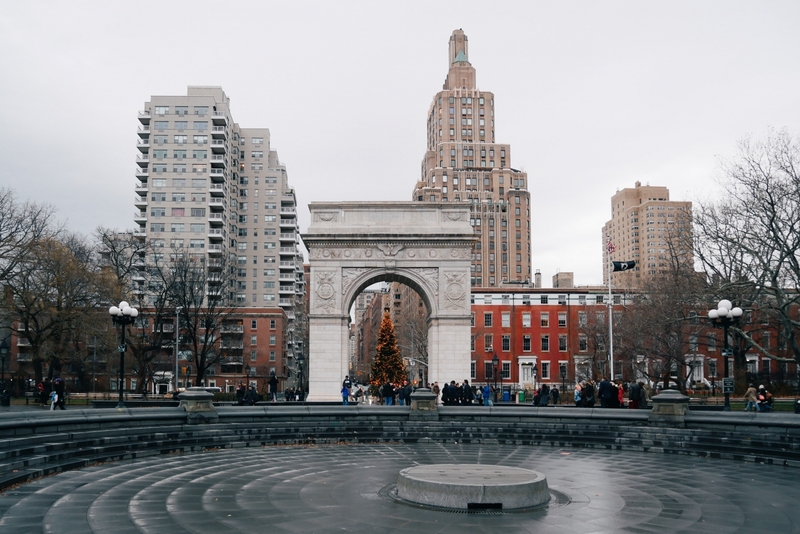 Union Square Holiday Market — A large al fresco market with 150+ local merchants selling handmade gifts, leather goods, jewelry, and art pieces. They also have food vendors serving crepes, churros, pretzels, empanadas, macarons, and sausages. Grand Central Holiday Fair — An indoor fair in Grand Central terminal’s Vanderbilt Hall—a good market to visit when it’s especially cold outside. They have 40 vendors operated by artists and businesses selling jewelry, art, crafts, and ornaments. Columbus Circle Holiday Market — An outdoor market in Central Park featuring 100+ booths with art, jewelry, home goods, and food items. These markets have specific schedules. Make sure to check the dates and times they’re being held. Brooklyn Flea’s Winter Flea & Holiday Market — New York’s most popular flea market. During the holidays, 50+ vendors sell candles, scarves, hats, vintage items, and more. There are also food stalls and a bar. This market operates in two locations: SoHo and DUMBO. Etsy Handmade Cavalcade — A DIY-focused market featuring 50+ fashion, beauty, and lifestyle craft sellers. It takes place on select dates in Manhattan and Brooklyn. Renegade Craft Fair — A large curated showcase of independent crafts, featuring 150+ stalls of handmade crafts and artisanal food and beverages. They hold the fair in various cities throughout the year, including a holiday fair in NYC. 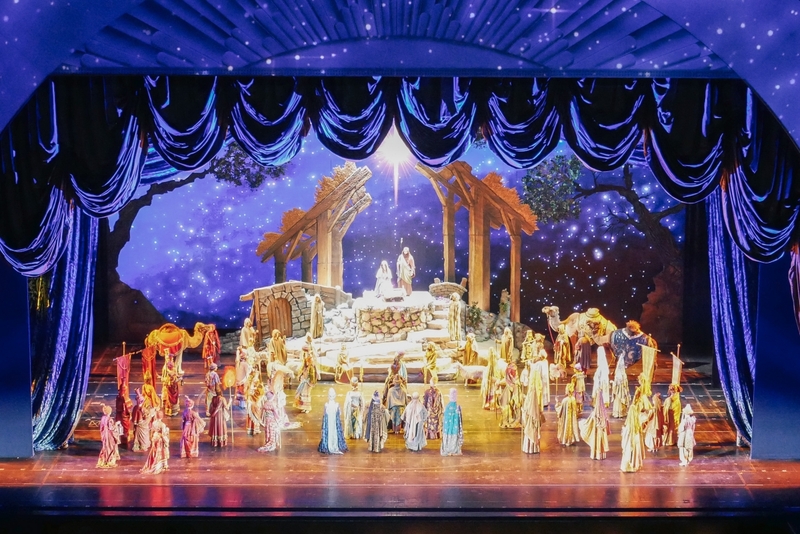 The Christmas Spectacular is a holiday-themed musical show with singing, dancing, and acting. It features the Rockettes, a women’s troupe famous for dancing and moving in sync. 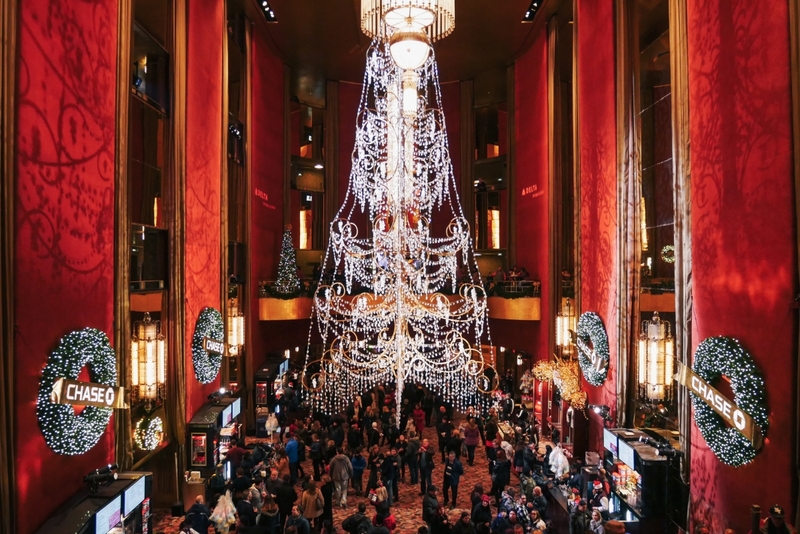 The Radio City Music Hall was a grand elegant theater. I bought and enjoyed freshly baked cookies from the food stands before proceeding to the show. 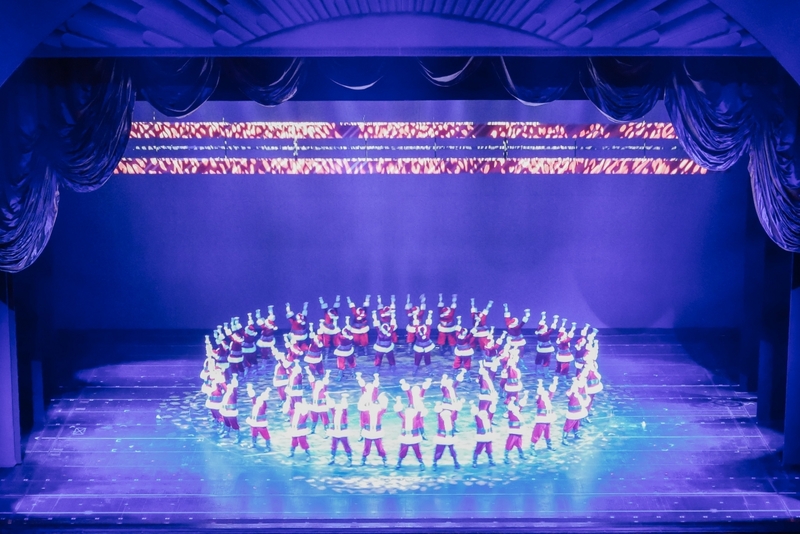 The Christmas Spectacular was an entertaining variety show composed of several holiday-themed acts. For example, one act featured two brothers—a younger one who was excited for Christmas, and an older one who was cynical about it. They went on a trip to the North Pole with Santa, and the older boy eventually came around. 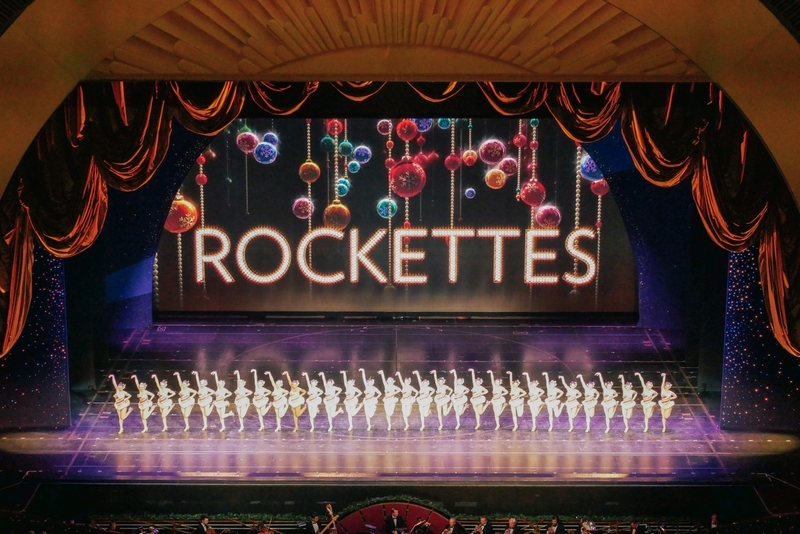 The Rockettes danced skillfully in all their acts. In one act, they were in a bus driving around the streets of New York in December (the streets were playing in perspective on the backdrop). In another act, they were dressed as nutcracker soldiers; they got in formation and marched in perfect synchronization. All in all, I enjoyed this show more than I’d expected. Visit the Brooklyn neighborhood Dyker Heights, and you’ll see homes with thousands of Christmas lights and large decorations such as nativity scenes and nutcrackers. 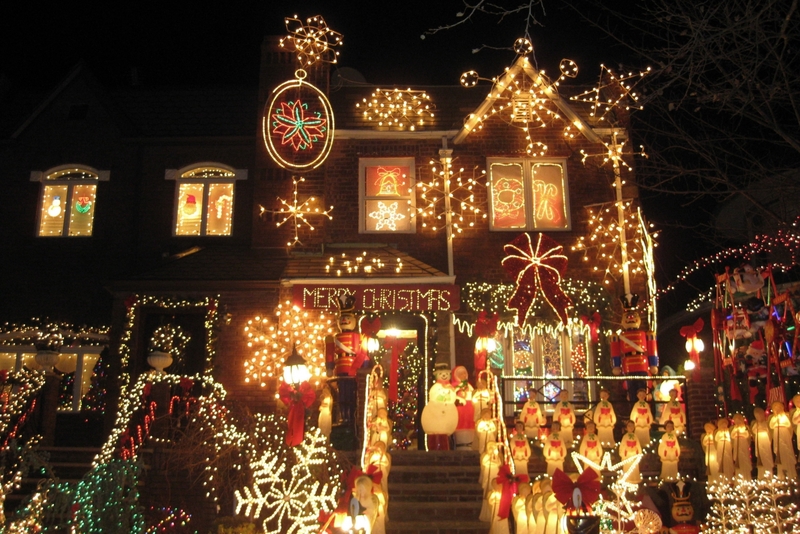 Word has it that it started off as friendly neighborhood competition, only later turning into an annual destination for dazzling Christmas lights and decor. These days, many of the houses are professionally decorated. The best displays are usually on weekends in mid-December or later. You can go there yourself, or take a walking tour or bus tour. 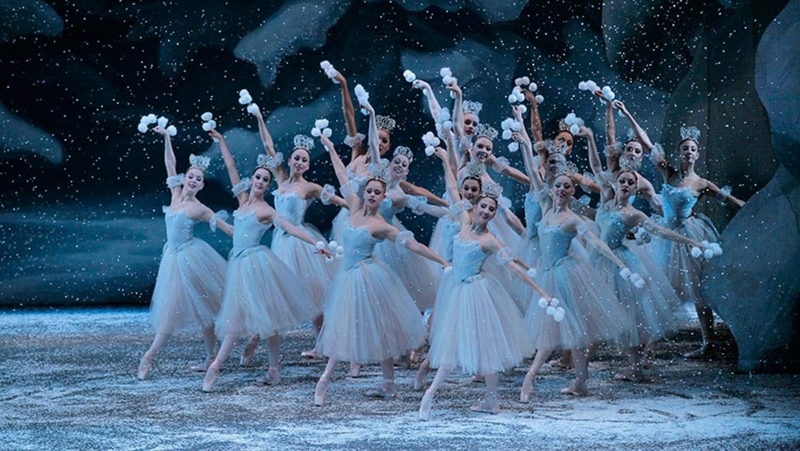 The Nutcracker — A two-act show performed by the New York City Ballet, one of the best ballet companies in the world. The choreography is unparalleled, and the set, props, and lighting make for enchanting visual effects. Paul Winter’s Winter Solstice Celebration — A multimedia show featuring music, singing, and dancing. The show is held on select dates annually at the Cathedral of St. John the Divine. The concept is inspired by ancient solstice rituals, where people gathered on the longest night of the year and performed rituals to await the sun’s return. Elf the Musical — A musical about an orphan named Buddy. He somehow crawls into Santa’s bag of toys and ends up in the North Pole, where he grows up thinking he’s an elf. When it becomes obvious that he’s human, he travels to New York in search of his birth father and true identity. A Christmas Carol — A musical based on Charles Dickens’s classic novella. Ebenezer Scrooge hates Christmas and treats others poorly. He’s visited by the Ghosts of Christmas Past, Present, and Future, all of whom show him how his behavior affects the people around him. In the end, he decides to be a better person and to enjoy Christmas. 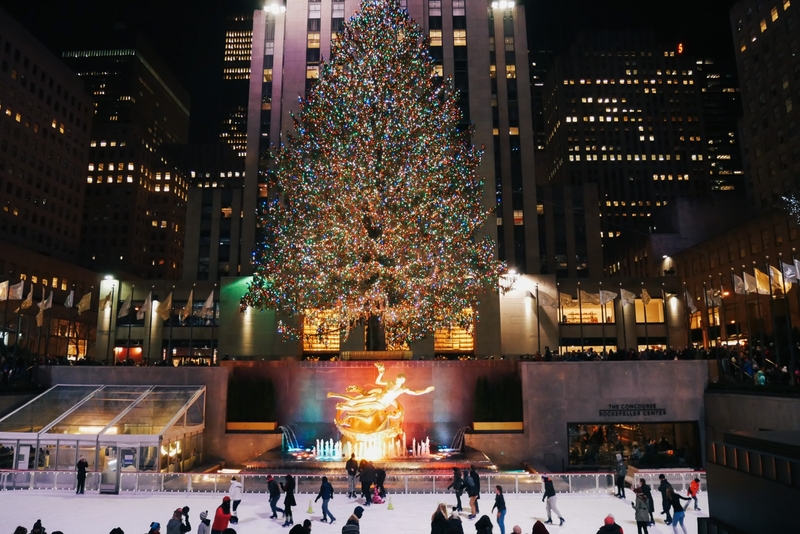 The Rink at Rockefeller Center — The most popular rink in NYC with the crowds and prices to match. Be ready to pay $25–32 per 90-minute session, add $12 to rent skates, and wait in long lines. If you really want to go, try the First Skate or VIP Skate package for a guaranteed no-wait reservation. I witnessed a marriage proposal during my visit. Everyone cleared out except for a man and woman, and then the man proposed. I wondered how he was able to do this. After a quick search, I discovered that the rink has a package for engagements. The more you know. They have a FAQ which does not include the question “What if my significant other declines my proposal?” I guess you’d better be certain of the answer, because by that point they would have already taken your time and money. The skating rink, I mean. 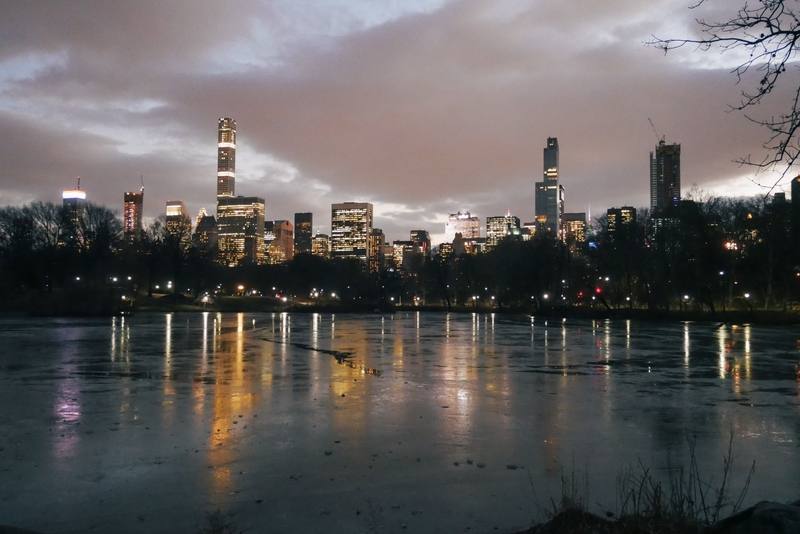 Wollman Rink — This Central Park rink comes with a great view of the city skyline. It’s also very popular but has shorter lines and lower prices than the Rockefeller rink. It’s $12–19 per session and $9 to rent skates. 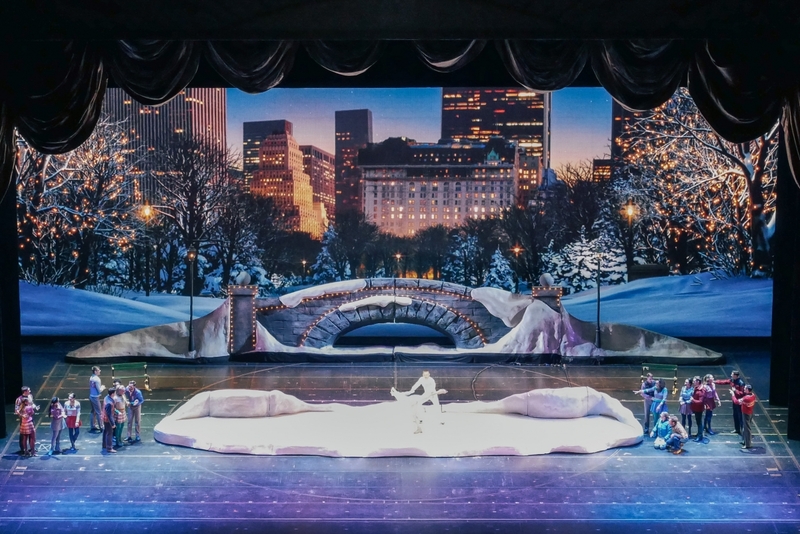 Bryant Park’s Winter Village Rink — With free admission and $20 skate rentals, this is probably the best deal if you still want an “iconic” New York skating rink. Of course, there’s still a wait unless you get an Express Skate or Reserve Skate package. Pro tip: When they resurface the rink, take advantage of the photo opportunity. Besides the above, there are several smaller skating rinks around New York. 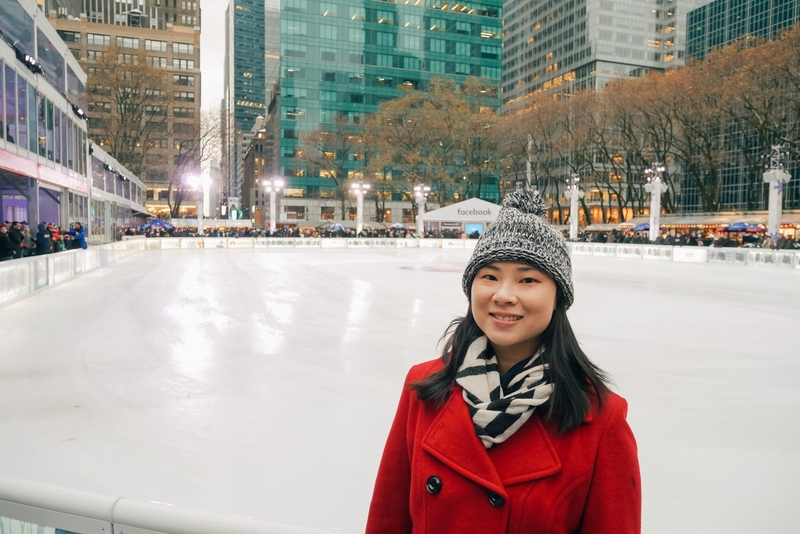 If you’re more into the actual skating and less into the quintessential skating-in-New-York-like-in-the-movies experience, your best bet is to avoid the rinks above and just check Yelp. 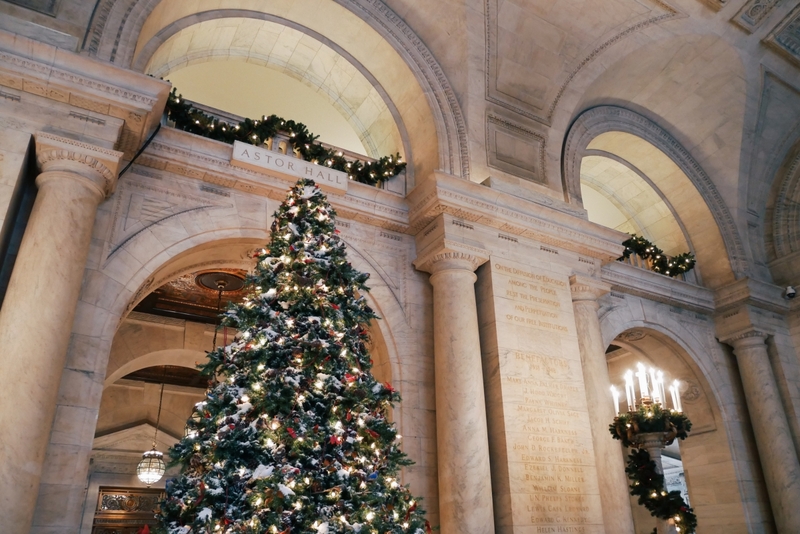 Even if you explore New York like you normally would any other season, you’ll get a lot of Christmas spirit for free. 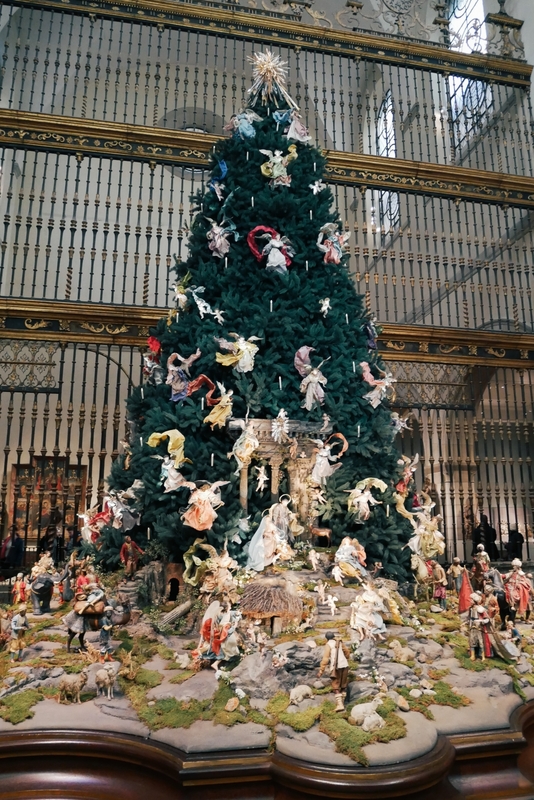 The Met — Visit the Medieval Sculpture Hall and admire the 20-ft Christmas tree, as well as the 18th century nativity scene below it. 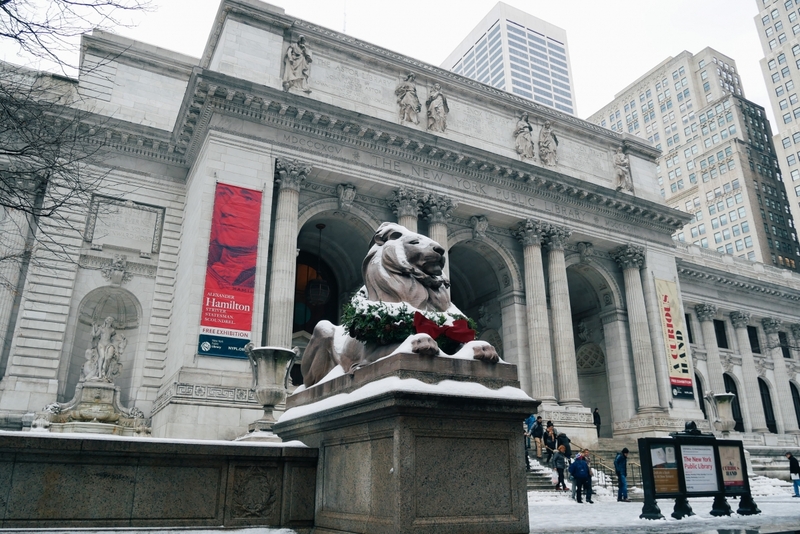 New York Public Library — The lions look stately wearing wreaths and covered in snow. 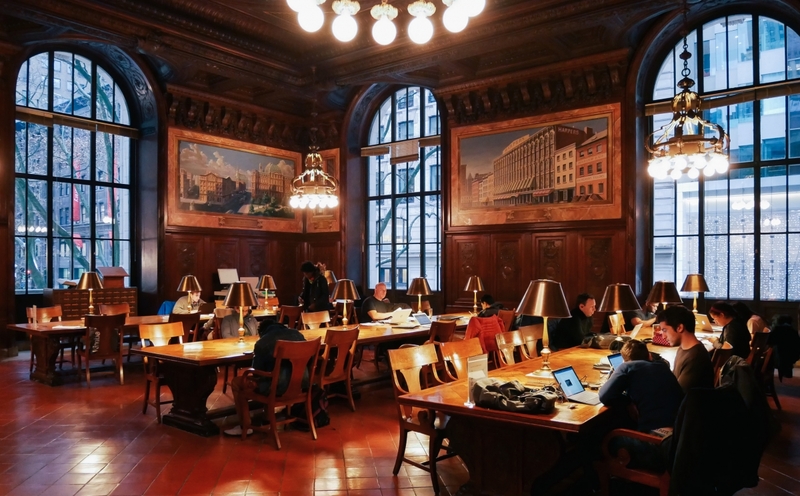 The library’s reading rooms make for a cozy sanctuary from the cold. Central Park — In winter, the park is less crowded than in better weather—and it’s beautiful when it snows. Empire State Building — Red and green lights illuminate the building in November and December. The best way to see it is from Top of the Rock, the Rockefeller Center’s observation deck. 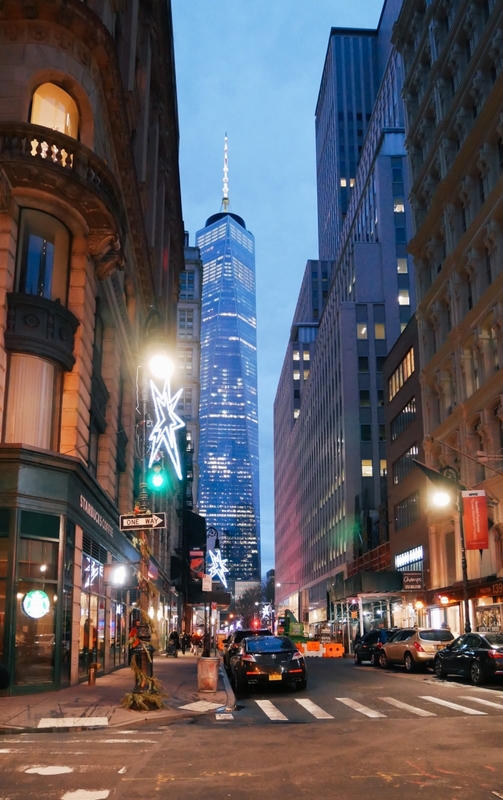 While New York is expensive throughout the year, prices are even higher during the holiday season. Plan far ahead to find better prices for flights and hotels. Make reservations for restaurants and busy attractions ahead of time. 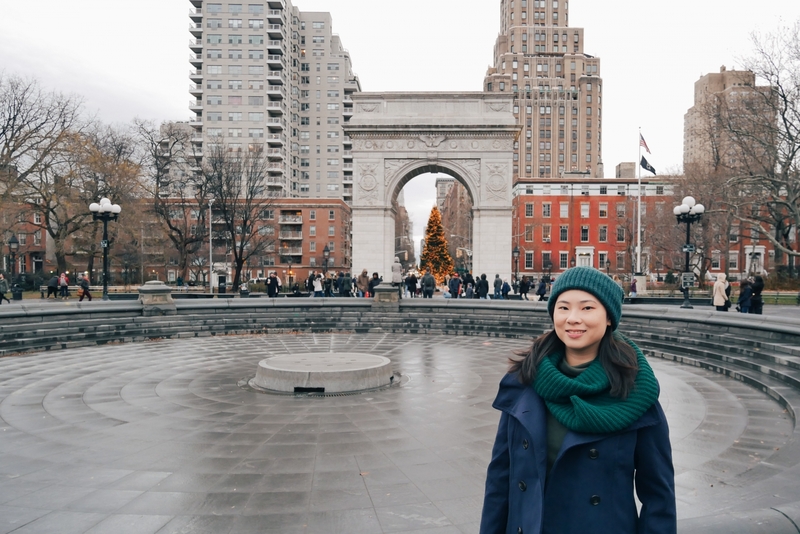 New York is a very popular place to go during Christmastime. When I visited, Fifth Avenue was absolutely crawling with people, and Rockefeller Center was packed even at 10:30 PM. Just go in knowing what to expect. Give yourself more time to transit between points of interest whether you’re traveling by car, subway, or even walking. 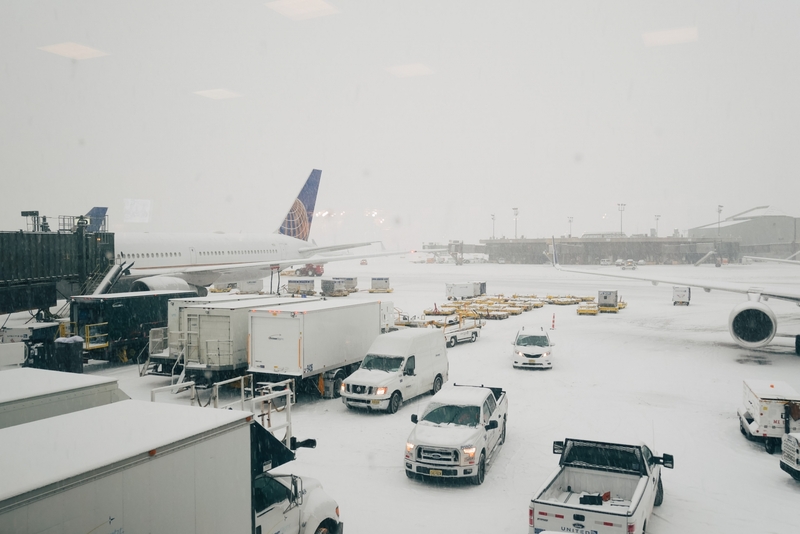 The cold will be an unwelcome companion in your otherwise wonderful trip. It can get seriously cold and windy. 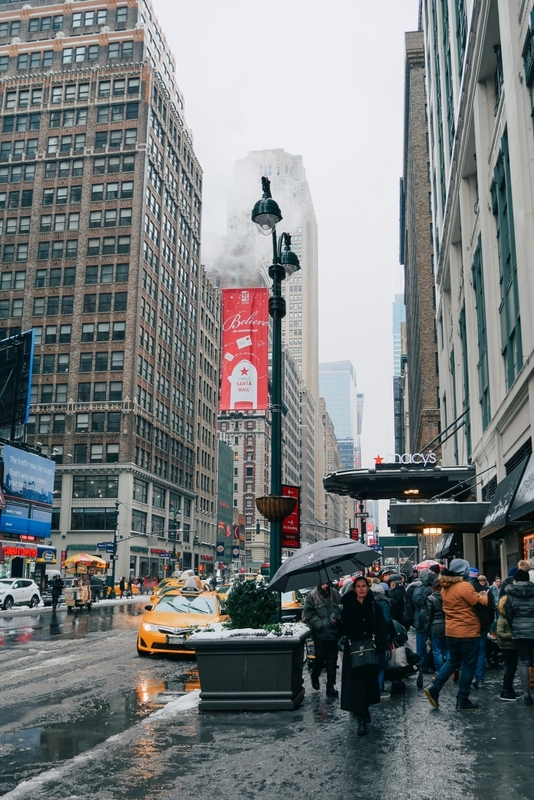 If you’re not used to chilly weather, I wouldn’t recommend a Christmas or winter trip for a first-time visit to New York. Either way, make sure to check weather forecasts beforehand so you can pack and dress appropriately. 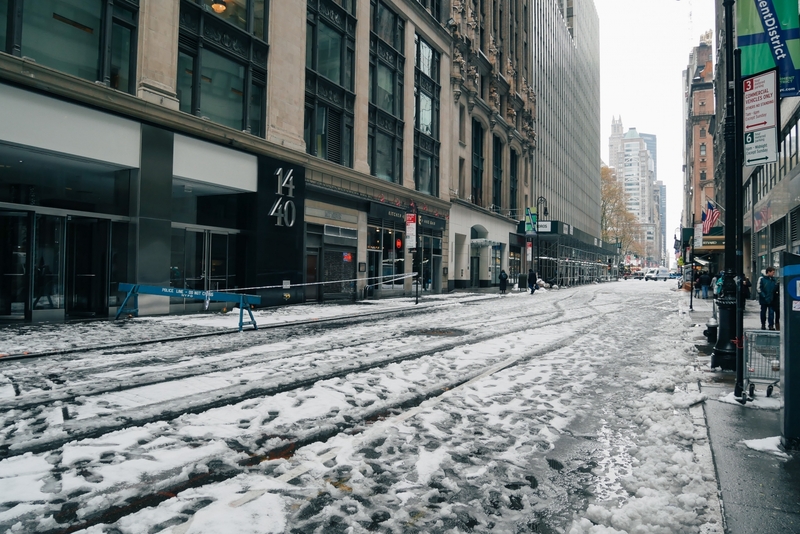 A note about snow: Snow in New York looks lovely when it’s fresh. But within hours, it turns into slush, which then gets mixed with dirt, dust, mud, garbage, and general city pollutants. In the end, you get a brown-gray-white slush that you have to step on when crossing the street. Suffice it to say that snow in New York is not fun—with the possible exception of places it isn’t constantly stepped or driven on, like Central Park. Scheduling activities can be a challenge during this time of year. The short days require you to schedule daylight activities into a narrow range of time. The gray weather and lack of sunlight may also make you less energetic. Given the daylight hours in December, the same activities now need to be crammed into the 10 AM to 4:30 PM time range. So my tip for planning a trip to New York in December is to put less on your plate than you normally would. I know, I know—it’s easier said than done in a city with so many things to do. 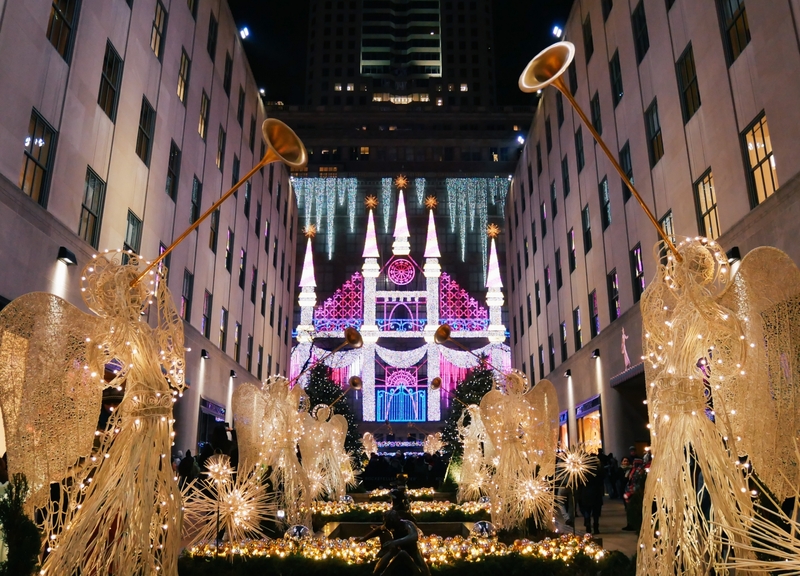 New York City is a fun place to visit throughout the year—but the bright lights, seasonal decor, and holiday cheer make Christmas in New York a special experience. If you’re well-prepared and know what to expect, you’ll have a good time. I would recommend taking this trip at least once in your life. 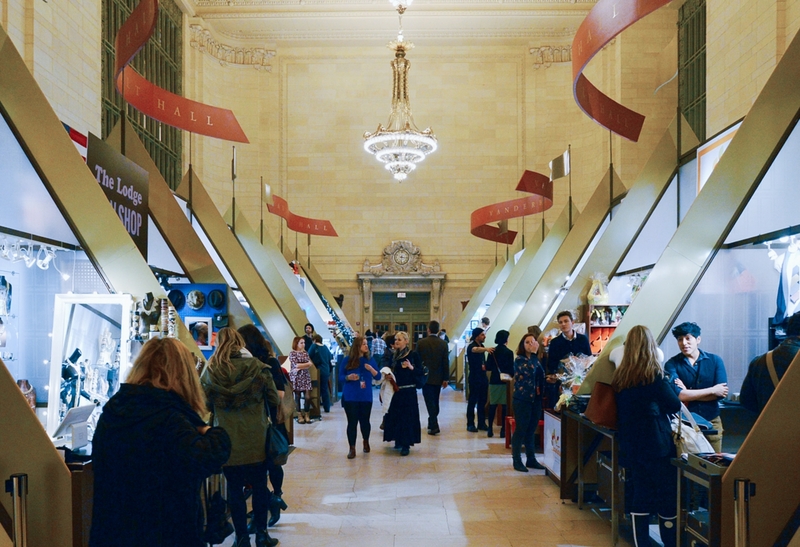 Photo credits: Grand Central Holiday Fair by MTAPhotos. Dyker Heights by Wally Gobetz. The Nutcracker by Paul Kolnik. 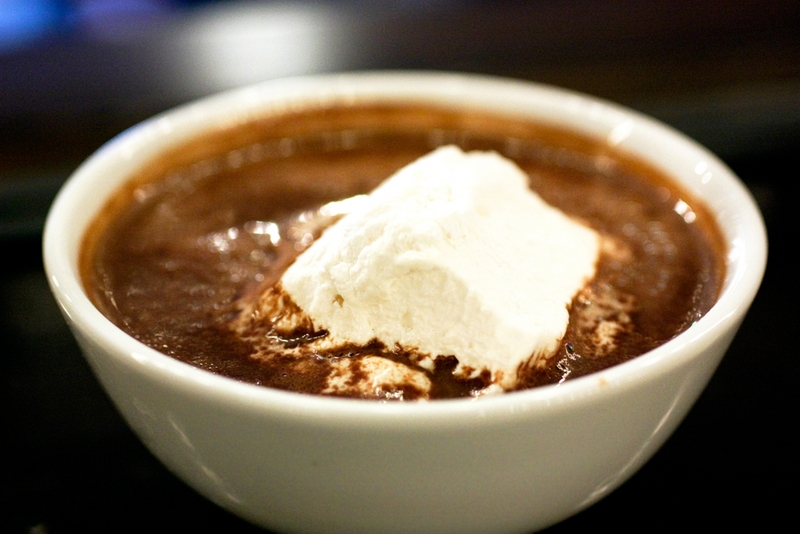 City Bakery hot chocolate by Bionic Bites.